River’s Early Prolific, blue‑purple skin, yellow flesh Late July Sweet with damson-like flavour Good in some areas Cooker, makes good red plum jam. Plums will grow in most parts of the world but as they flower early they are very vulnerable to spring frosts. The choicer kinds deserve the protection of a wall where protection from frost (and birds) can more easily be given. They do best in districts where the annual rainfall is between 50 and 90cm (20 and 35in). Damsons will succeed in areas having higher rainfall, and less sunshine, than plums will tolerate. fruits) do need calcium but they will not prosper in an alkaline soil. Plum trees planted in thin soils overlaying chalk often suffer seriously from lime-induced iron deficiency. No really satisfactory dwarfing rootstock has yet been found for plums. The two least vigorous are common plum and St Julien ‘A’; the former, however, is only compatible with certain varieties. Trees grown on these root stocks are sometimes described as ‘semi-dwarf’ but, even so, a standard or half-standard would be too large for the average garden, and even a bush-type tree requires a spacing of 4-5m (12-15ft) (on Brompton or Myrobalan ‘B’ rootstock, 6-7m [18-20ft]). Because plums do not produce fruiting spurs as apples and pears do, they are not so amenable to training, and are seldom satisfactory as cordons or espaliers. They may, however, be grown as fans, for wall-training or with the support of posts and horizontal wires, but root-pruning will probably be necessary every five years or so to restrain growth and maintain fruiting. A fan tree on St Julien ‘A’ rootstock should be allotted at least 5m (15ft) of wall space. Plums may also be grown as semidwarf pyramids on St Julien ‘A’ rootstock and this is a form, which is best for the small garden. Such a tree requires a spacing of 3.3m (10ft) and, as it will never be allowed to grow much over 3m (9ft) in height, it is possible to arrange some kind of cage or netting over the top of the tree to keep off birds, which will otherwise damage the fruit. An additional advantage is that the branches of a pyramid seldom break and there is thus less likelihood of infection by disease. For training as a pyramid a maiden should be planted in the usual way and the following March it should be headed back to 1.6m (5ft). Any laterals above 45cm (18in) from soil level should be shortened by half and any arising lower down the stem should be cut off entirely. Towards the end of July or early in August, when new growth has finished, cut back branch leaders to 20cm (8in), making the cut to a bud pointing downwards or outwards. Cut laterals back to 16cm (6in). Repeat this procedure annually. Leave the central leader untouched in summer but in April of the second year cut it back to one-third of its length. Repeat this annually, cutting the new growth back by two-thirds until a height of 3m (9ft) is attained. After that shorten the new growth on the central leader to 2.5cm (1in) or less each May. Plant plums in the usual way between November and March, the sooner the better, always provided the soil is friable. Stake securely and put down mulch to preserve soil moisture. 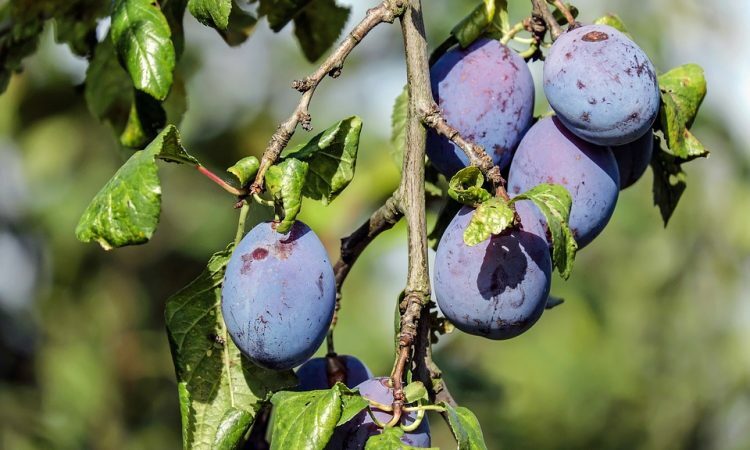 An established plum needs plenty of nitrogen but, until good crops are being carried, on most soils it will be sufficient to give a light mulch of rotted farmyard manure or garden compost in spring, and prick this lightly into the surface the subsequent autumn. When good crops are being borne, the yearly mulch may be supplemented with 28g (1oz) per dressing of Nitro-chalk and 14g (0.5oz) per sq. m sq. yd) of sulphate of potash, given in February. Every third year, add 28g (1oz) per sq. m sq. ft) of superphosphate. 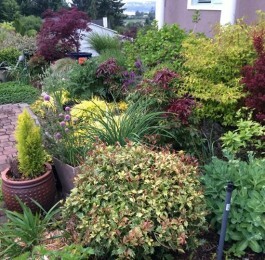 Where no manure or garden compost is available, peat may be used as mulch and the dose of Nitro-chalk doubled. The wood of plum trees naturally tends to be brittle and branches often break in late summer gales when the crop is heavy. Thinning of the fruit will help to prevent this form of breakage, and it is also advisable to arrange some kind of support for extra-heavily laden branches on bush-type trees. Wooden props may be fixed beneath branches (well padding the point of support) or a tall, strong central pole can be erected and branches supported from this by ropes, maypole fashion. 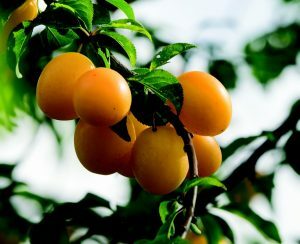 Dessert plums should be left on the tree until quite ripe and then picked by taking hold of the stalk so that the place. They will keep for a couple of weeks or so.